This is something I get asked about often so I thought I would do a round up of where we are now! I'm not sure I would have lasted long in Japan if I hadn't come across the playgroup when Ebi-kun was a baby, he was about 6 weeks old the first time I went along, very much for me back then not him! We would meet weekly, usually on a Thursday at a room that we could hire in one of the members apartments. We would sing songs and play some games with the babies/toddlers then usually go for lunch outside (weather permitting). 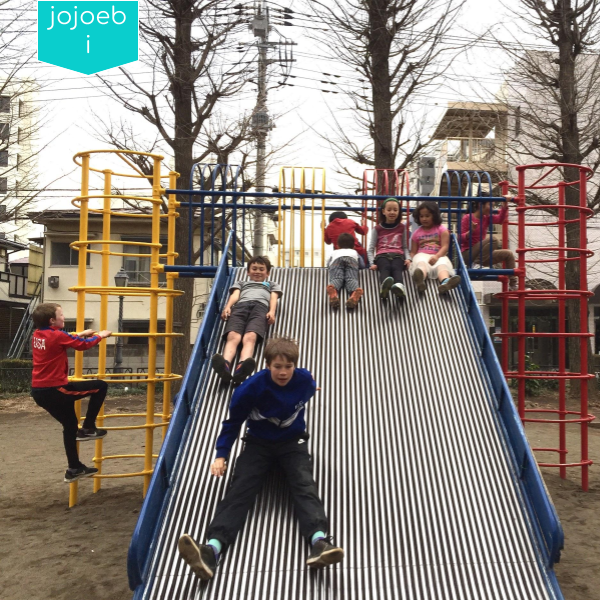 Sometimes we'd meet up at a jidokan - the city play centre or at the park and we would have regular events at the weekends. The kids became firm friends and even though they don't see each other that often you would never know. All our kids in the group are mixed race and bilingual, in some cases trilingual and the main purpose of the group was to have an English speaking environment for the kids to hang out in. We made it a rule that only English would be spoken, that was the adults too, which works most of the time. 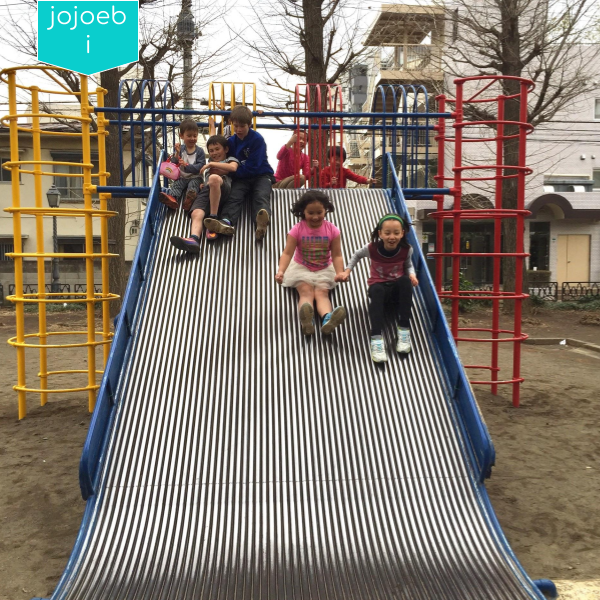 Now the kids are older, Japanese tends to be their play language or they switch back and forth but I do think that having the playgroup structure in place when they were little made a huge difference. It's hard to believe that most of these kids have been friends since they were babies. Unfortunately now they are older, we don't get to catch up as often but it's great that as soon as they do see each other, they are off having fun as if it were only yesterday they were hanging out. 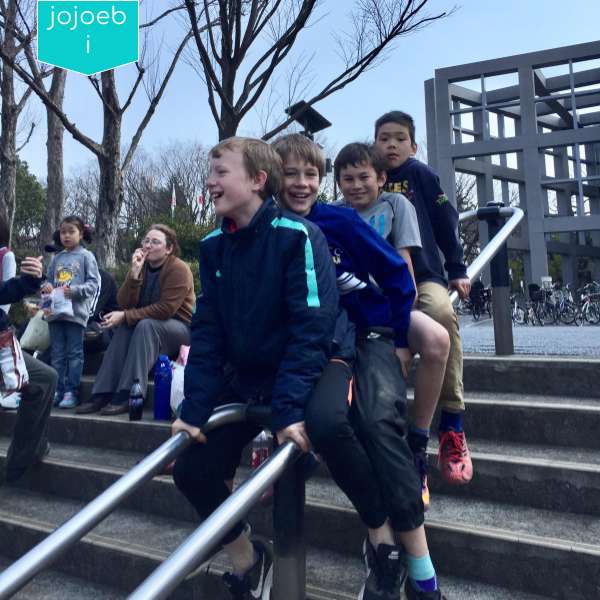 As we live in an area with very few foreigners we also felt it was important for Ebi-kun to have friends that were mixed race like himself so that he never felt weird or strange because he doesn't "fit in" with the local kids. He is different and that's something I want him to be proud of, not ashamed of. Apart from the bullying incidents in the first grade, he hasn't had any issues, he has found his place and his friends now think it's "cool" that he is bilingual. He doesn't get embarrassed about his English and knows that he can use it as a secret language sometimes! Having a fully bilingual child isn't an easy job and there is zero luck involved. It requires the parents to be dedicated and consistent in what they believe to be the best way forward. For us, that means using English as the family language and 95% of the time only English in the house. We try to watch the TV and films in English, we listen to English podcasts and music and chat with friends and family back home when ever possible. Every morning Ebi-kun reads a chapter of his book to me and at night I read to him before bed, we have just started the next epic journey... Lord Of The Rings. I know some people will think that at 11 he is too old to be read to be I think it gives us a great connection. Sometimes it is hard to find something in common to talk about, books bridge that gap. And there is the plus that we often watch the film version afterwards and dissect and compare it to the book. Writing is the one thing that we need to keep on top of, the rest falls into place but after a full day at school the last thing he wants to do is sit down and do a load of writing. I don't believe in workbooks or drill sheets so I try to make the writing fun, like the Dr Who story sheets and Mini Writing Books on topics that he is currently interested in. I'll do a separate post on what he is up to at the moment. Trips back to the UK are important too, having a grasp on the language isn't enough to be bilingual, the culture plays a part too and the best way to absorb the culture of a country is to be there. So although I joke about getting out of this hot sweaty hell hole in the summer, it isn't just for my armpits benefit, I want Ebi-kun to absorb as much of his heritage as possible. So yes, he has missed the summer fireworks and festivals in Japan and sometimes we have missed a Japanese event because a playgroup event takes priority - Halloween, Easter and Christmas parties are the main get togethers these days. But I feel that those sacrifices are worth it and that being bilingual and carrying both cultures with him are well worth it. This was so interesting to read about. My (English) cousin also married a Japanese national and stayed out in Japan. Their son is also being raised bilingual but I am not sure that he has much contact with other english-speakers.